"A focus on the creativity inherent in simplicity: using what you really need and making every drop count"
The Eat Alberta conference is an annual, one day, workshop-style event with a mix of hands on learning, food tastings, and demonstrations or presentations that focus on local and regional Alberta foods. I am very honoured to be one of this years presenters. Participants come together with farmers, chefs, winemakers, foragers, bakers, and beekeepers to learn about what is produced in our province, how to prepare it, and what it tastes like. Past attendees have expressed that that the variety of sessions, quality of teaching, and exposure to local food heroes is second to none. Better yet, they tell us that the value for their dollar is unparallelled. This year the Eat Alberta conference will be on Sunday, April 29th and take place at the Northern Alberta Institute of Technology (NAIT). Ian Griebel is a farmer and food eater, running RedTail Farms outside Castor, Alberta with his wife, Dana, and two sons, Cohen and Fynn. Ian practises holistic grazing methods—rotating his cattle and pigs on grass during the warmer months, and bale grazing during the winter—all while repairing and regenerating the ecosystems that feed his farm, and following his farm's motto: "Three generations, looking seven generations forward." KEYNOTES PRESENTER: KEVIN KOSSAWAN Kevin Kossawan owns and operates a story production company called Story Chaser Productions and has worked with folks like Alberta Culinary Tourism, Alberta Agriculture and Rural Development, University of Alberta, Canadian Cattlemen’s Association, Alberta Pulse Growers, and Slow Food in Canada. Past projects include a few years of contribution to the Alberta Conservation Association‘s ‘Conservation Magazine’ and ‘Discover Guide’ writing about wild food, board service for the City of Edmonton Food Council, Alberta Farmers’ Market Association and Operation Fruit Rescue Edmonton, contributions to the FarmOn Farm Masters program, and facilitating farm and foraging experiences for NAIT’s culinary program. French Canadian culture adds a unique flavour to Canadian cuisine that extends greatly beyond the well loved poutine. Largely based on hearty comfort foods and seasonally available ingredients French Canadian cuisine focuses heavily on readily available basic ingredients prepared in wholesome dishes that preserved the ingredients integrity. Tuck into some French Canadian dishes with Chef Steven Brochu of Chartier and learn to create a Quebecois classic. Steven Brochu is the head chef of Chartier in Beaumont, Alberta, where he uses locally sourced ingredients to bring French Canadian cuisine and inspiration to the community. Looking into old family recipes and stories have helped create a unique dining experience for guests at Chartier. Sarah Louise is a local entrepreneur and food educator. With a penchant for veganizing classic comfort foods, she has founded Blue Rose Baking Co. (https://bluerosevegan.ca/), as well as Edmonton's first vegan snack box, YEGSNACKS. She can currently be found teaching cooking classes through The City of Edmonton & The Pan Tree in Sherwood Park, and online sharing recipes and ramblings over at Sarah Louise AF (https://sarahlouiseaf.com). Elyse Chatterton is a butcher, blogger, teacher, baker and passionate gin and tonic drinker. Elyse began her career as a butcher when she was 14 years old under the guidance of her family in the North West of England. In 2011 Elyse moved to Edmonton with her husband and two children; she has since worked with Sangudo Custom Meats, Shovel & Fork and Tofield Packers. 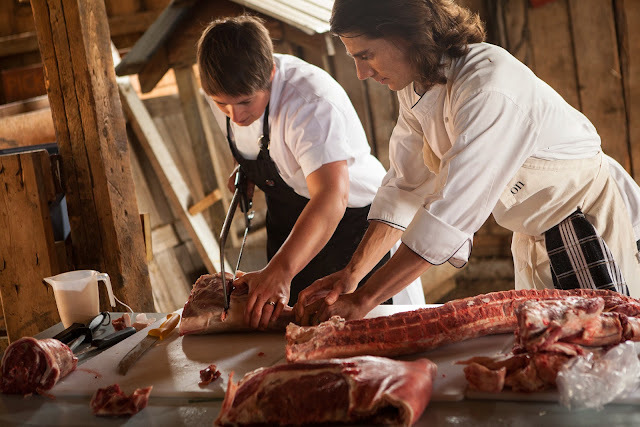 Elyse believes that everyone can benefit from having some basic butchery skills in their kitchen, helping them get the best cuts of quality meat from the best animals. Elyse can be found teaching at Get Cooking Edmonton where she shares her passion for all things food. Blair Lebsack is the chef and owner of Edmonton's RGE RD, which focuses on Canadian cuisine, seasonal ingredients, and using every part of every ingredient. Blair is an experienced teacher, and will be returning to his old stomping grounds at our event - he used to teach culinary arts at NAIT. Now he’s educating diners on the process of how we get our food from farm to fork.